Happy New Year! I hope everyone had a fabulous ringing in of 2013 and is now back in the swing of things! As some of you may know, the 2013 Pantone Color of the Year is Emerald. It has been cropping up on the runway, gaining popularity in jewelry, and making a tremendous impact on interiors. Emerald is one of my absolute favorite colors, and I have really enjoyed using it in interiors myself. It is rich and impactful; it goes beautifully with neutrals or with other bold tones. It can be used in small doses or take over a whole room. Wouldn’t you love to welcome your guests with this juicy front door? What a wonderful choice! Who wouldn’t notice this beauty driving by or comment on it? Green is a color that carries a bit of intrigue and mystery. I’m just dying to know what is on the other side of this door. Like I said, a little bit of green can go a long way. Don’t you love how Tobi Fairley put these emerald lamps in this all black, white, and pink space? They really pop! Here’s another great example of a little bit of green going a long way. This modern, cool, fresh palette is the perfect setting for these incredible quilted velvet chairs to be the stars! I also appreciate how greenery makes an appearance in the shelving unit. It really pulls it all together. What a wonderfully warm dining space! The rich, green leather chairs perfectly balance the goldentones of the walls, chandelier, and brass nailhead. Don’t you just adore the golden handles atop the backs? I could definitely enjoy dinner in these yummy chairs and under the watchful eyes of the funky portraits. When just a touch of green won’t do the trick, then why not go all out? How awesome is this bold and bright combination? It’s like the perfect British meets Palm Beach summer cottage! The toile wallpaper sets the tone for the whole room, and the emerald linen headboard stands out as much as the wonderful wings and bedside table. The tufted headboard reminds me of some of the ones we have made in our custom workroom here at Nandina. You could also go crazy with accessories alone. This amazing home is chock full of green! 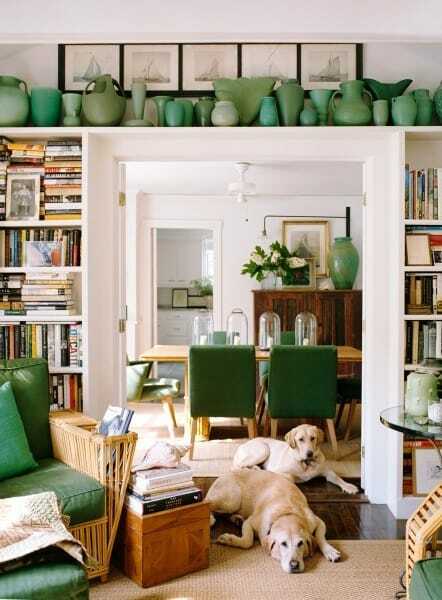 I love the collection of jade jugs and vases on top of the bookshelves. Now that is a collection that makes a design statement! Perfectly placed ceramics and greenery throughout the rooms accent the emerald chairs in each space. The whole home looks perfectly layered and collected. The cute yellow labs certainly look comfortable. The other lovely thing about this home is that you could trade out the green for just about any color of the rainbow, and it would still work beautifully. I hope you are looking forward to an emerald-filled new year! If you would like to integrate green into your own home – in paint, furniture, or accessories – stop on by and visit us at Nandina Home & Design, and one of us will be thrilled to help you!